A climate similar to that of Earth's deserts, with intermittent floods and long dry spells, reproduces the valley networks seen at left. 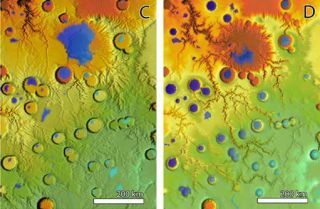 Another scenario (right), with intense deluges over a short period of time, produces landforms that don't exist on Mars, such as breaches of crater rims. Valleys on Mars were carved over long periods by recurring floods at a time when Mars might have had wet and dry seasons much like some of Earth's deserts, a new study suggests. The research contradicts other suggestions that the large valley networks on the red planet were the result of short-lived catastrophic flooding, lasting just hundreds to a few thousand years and perhaps triggered by asteroid impacts. The new modeling suggests wet periods lasted at least 10,000 years. "Precipitation on Mars lasted a long time – it wasn't a brief interval of massive deluges," said study leader Charles Barnhart, a graduate student in Earth and planetary sciences at the University of California, Santa Cruz. "Our results argue for liquid water being stable at the surface of Mars for prolonged periods in the past." NASA planetary scientist Jeffrey Moore and Alan Howard of the University of Virginia contributed to the research, which will be detailed in the Journal of Geophysical Research – Planets. In recent years, pictures of Mars have revealed a landscape clearly shaped by runoff. Most researchers now see water as a key player, though carbon dioxide has also been put forth as a possible culprit. A recent study of Box Canyon in Idaho concluded that similar features on Mars could have been sculpted by ancient megafloods. Whatever, Mars is bone-dry today, and it's not clear just how wet it was in the past. The new work, based on computer models, paints a picture of ancient Mars, more than 3.5 billion years ago, as looking somewhat like the deserts of the U.S. Southwest, sans cacti of course. The new thinking is based on the idea that asteroid impacts, as fuel for floods, would have created features that aren't found on Mars. "Our research finds that these catastrophic anomalies would be so humid and wet there would be breaching of the craters, which we don't see on Mars," he said. "The precipitation needs to be seasonal or periodic, so that there are periods of evaporation and infiltration. Otherwise the craters overflow." The computer models generated 70 different simulations, including one that yielded the best match to the observed topography of martian valleys. The sculpting was done in a semiarid to arid climate that persisted for tens of thousands to hundreds of thousands of years, the researchers say. Episodic flooding alternated with long dry periods when water could evaporate or soak into the ground. Rainfall may have been seasonal, or wet intervals may have occurred over longer cycles. But conditions that allowed for the presence of liquid water on the surface of Mars must have lasted for at least 10,000 years, Barnhart said. The study does not suggest what a typical day on Mars might have been like back then. Nor does the work pin down how long seasons might have lasted. Barnhart said the changes from dry to wet periods might have had to do with periods of greenhouse-gas outgassing associated with volcanic eruptions, large impacts, or a change in the tilt of Mars' rotation, though all that remains to be studied further. "Our results do suggest that river discharges were similar to flood stages in Earth-like desert environments like the Mojave desert or the Colorado Plateau," he told SPACE.com.